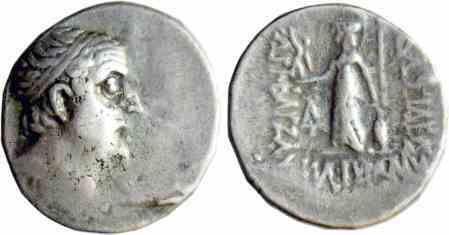 Silver drachm, 16mm, 4.2gm, issued 95-63 BC. Rev: BAΣIΛEΩΣ APIOBAPZANOV ΦIΛOPΩMAIOY, Athena holding Nike and shield and spear, AI monogram to left. References: see Sear 7301, Simonetta 48.